DOMENICA 6 SETTEMBRE: "UN LIVE TUTTI INSIEME PER BENEDETTA!" 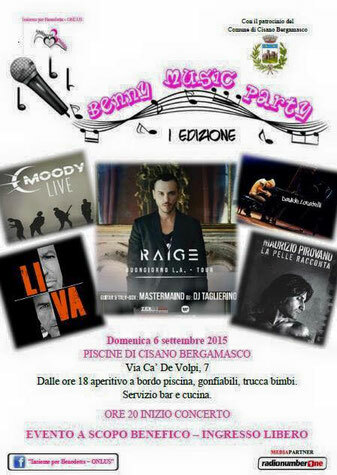 DOMENICA 6 SETTEMBRE DALLE ORE 19,00... SI PARTE CON IL PIANO DI LOCATELLI PER POI PASSARE A NOI (CIRCA LE 20,30) A SEGUIRE MOODY, RAIGE ED I LIVA... TUTTI INSIEME SUL PALCO DELLE PISCINE DI CISANO PER LA ONLUS "INSIEME PER BENDETTA"!!! NON MACATE E PORTATE IL CUORE.